The Esri Startup Program helps emerging businesses add location analytics to their services and solutions. Companies founded less than three years ago that build software or platform-as-a-service products and currently generate less than $1 million annually may be eligible to participate in the Esri Startup Program. This three-year program provides qualified businesses with free ArcGIS platform technology to integrate spatial functionality into their products. Members receive software, tools, support, and opportunities that help their businesses succeed. Key benefits include access to an ArcGIS Online organizational subscription, an ArcGIS for Server license, and the Esri Developer Network package plus training, support, and maintenance. Startup Program participants also have opportunities to attend and exhibit at Esri conferences and comarket with Esri business teams. Taking advantage of this support, these startups build revolutionary technologies for many industries, including utilities. Learn more and sign up. DataCapable's social media map displays real-time feeds about power outages across the United States. Social media is fast-tracking business communications. People now use social media to contact their utilities—even to report outages. And progressive power companies reportedly recognize social media as a reliable resource for outage information. Esri emerging partner DataCapable helps energy companies put social media data to work for customer service, outage management, and storm impact prediction. The company’s UtiliSocial solution mines, maps, and analyzes social media in real time so utilities can interpret customer engagement and satisfaction and even get a dependable, upgradable operational view of the grid. 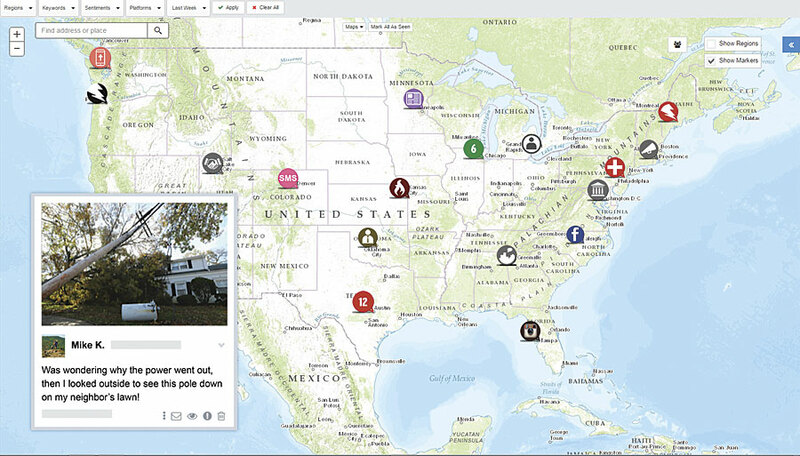 In just one year, DataCapable captured more than one million outage-related social messages, many of which included photos and videos that can help dispatchers get the right truck to an emergency, faster, for example. By combining diverse sets of outage data with social media commentary and on-the-ground images from customers, operational staff can also better understand events in real time, aiding predictive storm modeling. Res-Intel maps out houses' energy efficiency scores. The ones in blue need energy upgrades. Using GIS, startup company Residential Energy and Water Intelligence (Res-Intel) helps homeowners and utilities build realistic energy and water efficiency strategies. For homeowners, Res-Intel uses utility company data to determine how much energy houses in a given area consume, plus what each residence pays. Property owners can then compare their consumption to their neighbors’ and see what efficiency investments people around them are making. For utilities, Res-Intel profiles individual properties to determine their energy and water consumption, enabling companies to make energy efficiency suggestions relevant to each property. 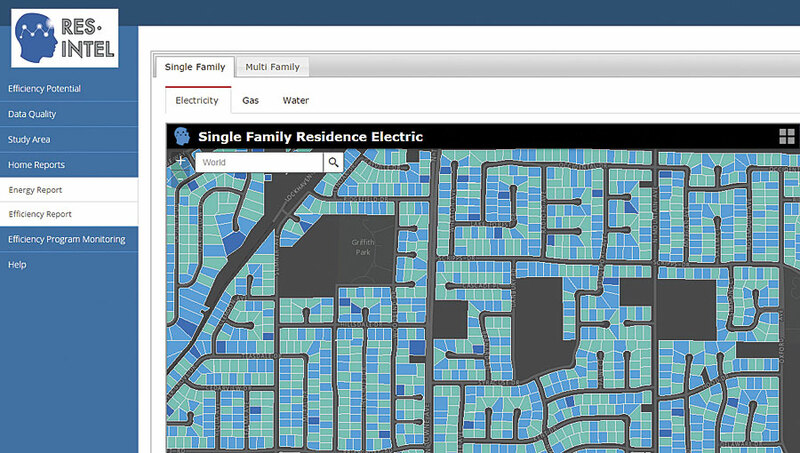 Res-Intel also uses ArcGIS Online to map housing types (single-family homes or apartments, for example), demographics, and wealth data to help utilities figure out who makes energy conversion decisions and which properties can afford up-front costs. Companies can also see where energy intensity scores are high and use community-based outreach to target efficiency investments.